Inside Storey: A Mystery Giveaway! 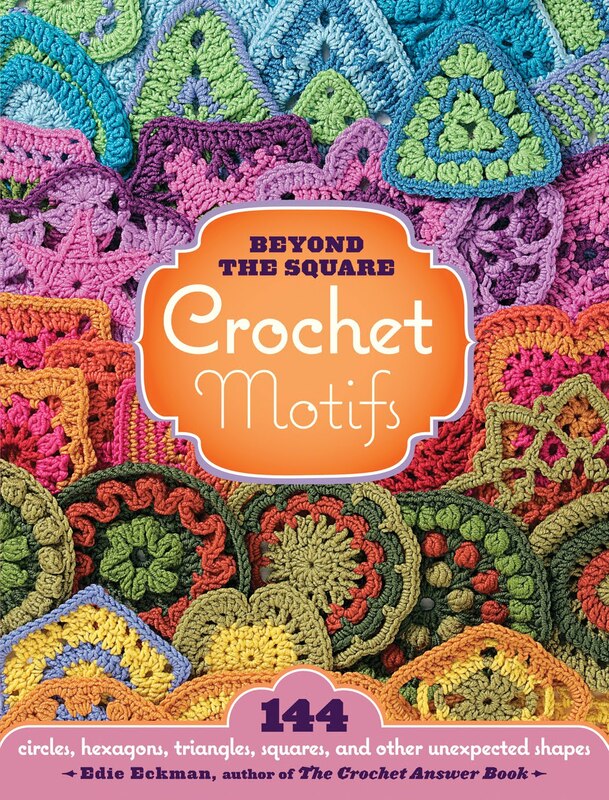 There's a mystery in the crochet world right now. 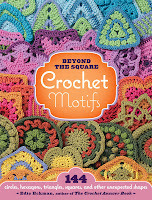 Author Edie Eckman received a post from a reader who spotted a motif on the cover of her book, Beyond the Square Crochet Motifs, and in the book itself, but . . . there are no instructions for it anywhere! Edie wrote on her Ravelry forum (Edie Eckman Stitchers), "Apparently there's a motif that's photographed but doesn't appear in the instructions. Kudos for having such a keen eye! Clearly I made the motif, but for some reason it didn't get included in the instructions pages, either because I forgot to send the pattern to the publisher, or because there wasn't room. Or perhaps one of those weird book-publishing things happened that you wouldn't even know about unless you've actually written a book. Stuff happens." Well, Edie figured out the instructions for the "Mystery Motif." They are written below — but we wanted to reward the sharp-eyed among you. 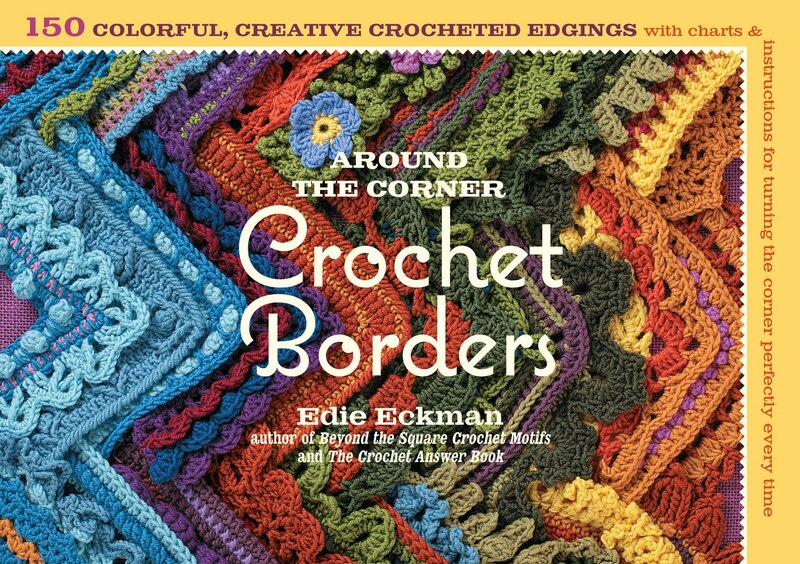 If you can spot which motif is photographed but does not have matching instructions, we'll give you a copy of Edie's book Around the Corner Crochet Borders. Send your guesses to publicity@storey.com, and we'll reward the first five winners. Mystery Motif Rounds 1, 2, 3, 6, and 7: Color A. Rounds 4 and 5: Color B.
Rnd 1: With color A, ch 1, 6 sc in ring, join with slip stitch to first sc—6 sc. Rnd 2: Ch 4 (counts as tr), tr in same st, ch 3, *2 tr in next sc, ch 3; repeat from * four more times, join with slip stitch to top of ch-4. Rnd 3: Ch 1, *sc in next 2 tr, 5 sc in ch-3 space; repeat from * five more times, join with slip stitch to first sc. Fasten off. Rnd 4: With Color B, (standing sc, ch 1, sc) in center sc of any 5-sc group, ch 2, (FPtr around next tr from Rnd 2) two times, ch 2**, (sc, ch 1, sc) in center sc of next 5-sc group; repeat from * around, ending last repeat at **, join with slip stitch to first sc. Rnd 5: Ch 1, *(sc, ch 1, sc) in next ch-1 space, 2 sc in ch-2 space, sc in next 2 tr, 2 sc in next ch-2 space; repeat from * around, join with slip stitch to ch-1. Fasten off. Rnd 6: With Color A, (standing sc, ch 1, sc) in any ch-1 space, *ch 3, (FPtr around next tr from Rnd 4) two times, ch 3**, (sc, ch 1, sc) in next ch-1 corner; repeat from * around, ending last repeat at **, join with slip stitch to first sc. Rnd 7: Ch 1, *(sc, ch 1, sc) in next ch-1 space, 3 sc in ch-3 space, sc in next 2 tr, 3 sc in next ch-3 space; repeat from * around, join with slip st to first sc. Fasten off. Remember, send your guesses to publicity@storey.com, and we'll reward the first five winners.